Our dogs are such amazing little creatures. They are part of our families. They love us unconditionally and we love them! Did you know they have healing powers too? And she talked about how her husband was in the hospital fighting liver cancer. His blood pressure was way too high and they couldn’t seem to get it down…until McKinley came to visit her daddy. Then it dropped down to completely normal. Lynda (McKinley’s mom) says that Mckinley and brother Rascal helped her when she went through chemotherapy for 2 years and now it’s her husband’s turn. Another member Tina-Marie told about how her Chihuahua Nalla warns her when Tina-Marie is about ready to have a seizure. I find that fascinating. Some people now get their dogs certified as emotional support dogs. And they really do help with our emotional well being. Watch this video of how this dog helps a boy with Autism. Dogs have helped veterans suffering P.T.S.D. deal with their flashbacks. They help emotionally traumatized children to heal. I know my dogs have helped me deal with some traumatic events in my life. I don’t know what I would have done if I didn’t have them to turn to. We have heard about dogs being able to sniff out cancer. And I mentioned above how they can also warn someone when that person is about to have a seizure. It has been proven in many studies that petting a dog has a calming effect on our bodies. Our blood pressure is lowered. 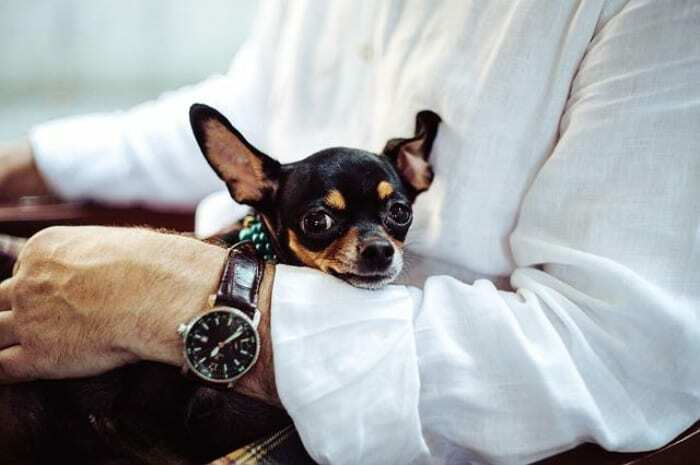 The University of New York found in a study of stockbrokers who were being treated for hypertension, that almost half of those who adopted a dog, lowered their blood pressure enough that they were able to go off their medication for it. In the August 2002 edition of the Journal of The American Medical Association there was an article on the results of a study showing that children who grow up with pets have a reduced chance of allergies and asthma. 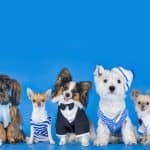 Dr. Erika Friedmann of Brooklyn College found in a study that those heart attack victims that owned a dog, were 8 times more like to survive one year after suffering the heart attack. 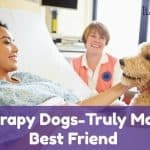 So in other words, pets help us deal with pain. 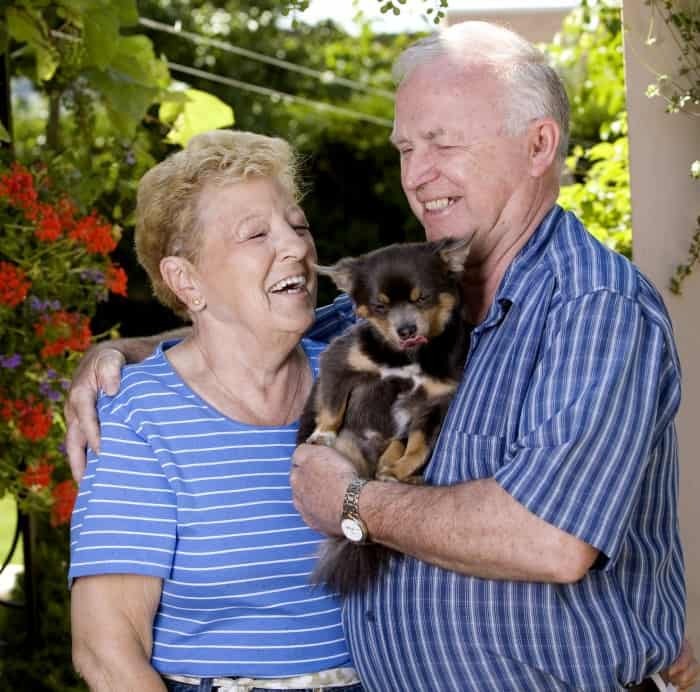 There have been studies that show that elderly people who own dogs help delay dementia. That’s because taking care of a dog helps the person to have something to focus on. Dog ownership also provides them with exercise, companionship and gives them something to live for. I have personal experience with this. After my mother’s beloved dog Prince died, she just seemed to lose interest in living and felt like she no longer had a reason to get up most mornings. 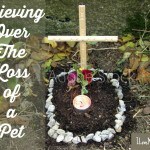 She passed away about a year after her dog died. Dogs truly are God’s little furry angels sent to earth to help us. Do you agree? 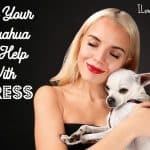 Has your dog helped you heal? I’d love to know your story. Let us know in the comments. That’s wonderful Angela! I agree, they are powerful little angels! I could not imagine life without my precious fur baby Chester. I got Chester from the time he was a little 9 week old puppy, he’ll be turning 4 in August of this year, and he has brightened up my life! Before him, I’d never ever considered getting a chihuahua but thanks to him, I am completely enamoured with the breed. He is the sweetest and most loyal dog I have ever had!!! I love absolutely everything about him: from his huge eyes and big ears to his sunny disposition, he is a true pleasure to have around! He sleeps in my bed every single night, snuggling up to me whether it’s under the blankets or top of them. I suffer from anxiety and there is nothing more soothing and calming than holding him in my arms and having him lick my face and look st me with his beautiful loving eyes!!! Love you with all my heart my precious Chester!!! Chester is adorable Diane! I’m glad you have him to help you through your anxiety. Thank you Cathy! He is a true blessing!!! I have had a chi. For years but I knew after 18 years it was going to be not to long until she had to go over the rainbow bridge, and since I had just lost my husband of 52 years, I was really afraid of loosing her also. One day going to the humane society to give. Donation in memory of my husband there was what I thought was a bird out side area for dogs. I watched and pretty soon out came this little dog. It was in, the pen with larger dogs and was scared to death. I went immediately and got help and told them what was happening and they came out and asked me if I,d like to hold her.well of course the rest is history. Yes sissy did go over that bridge shortly ,but I have misty who I thank god every day for. I couldn’t,t have gone on with out her. My Chi banies know exactly where my pre skin cancer is and lick those spots. Also I have muscle issues and my arm was killing me andmy two chi babies knew and went to town licking the worst painful spots. No cure but they like to lick where I have pain on my feet, legs etc. I love them. That’s a wonderful story Nan. So glad you rescued Misty! I suffer from severe panic attacks and got to the point of not wanting to leave my house alone. My husband suggested adopting a puppy and it was love at first sight. She is now my emotional support dog and I feel like I have my independence back. That’s great Mandy! So glad your little girl has helped you so much. I love that Mary! 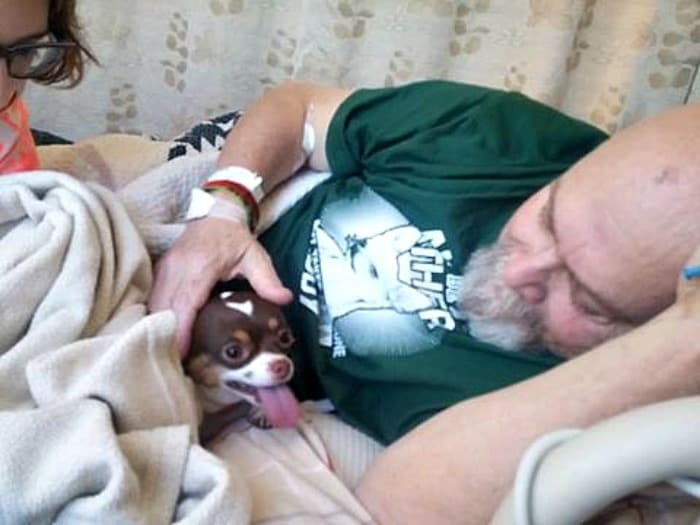 What a great example of how dogs help heal us. That is awesome Carmen! What a cute little trooper Tobytaz is! 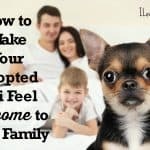 I feel my Chi and Min Pin have became part of our family at the perfect time. They fill voids left by our children having families of their own. We refer to Gigi and Zoe as the “Kids”or the “Girls”. They have so much love to give. We have been blessed by them. You are very lucky A.J. to have 2 such sweet little girls. My mixed breed Mooch detected cancer in my left leg long before the doctors did. I adopted Mooch when he was only 4 weeks old, and from day one, he was my shadow. I started noticing after Mooch turned 7 years old, he seemed obsessed with my left leg. He would stand against my leg, lick it , and lie down on my left foot whenever I was sitting in a chair. I made jokes about how he was in love with my leg. After a routine doctor’s visit, I had mentioned that I had a bump on my left knee for ages that wouldn’t go away, so my doctor had me return a week later for a biopsy, and the results came back that it was indeed a cancerous tumor. It was a very rare cancer called Merkel Cell cancer. It then dawned on me that had to have been why Mooch had been so obsessed with my left leg! He knew there was something not right. All during my radiation treatments and surgeries, Mooch would stay by my left side, but not make contact with my left leg. It was like he was protecting my leg though. That was 2 years ago, and Mooch ended up with numerous cancerous tumors on his left hind leg and abdomen that were inoperable. Mooch died in my arms a year ago. I miss him everyday. I loved that big ol mutt. That’s an amazing story about Mooch! Dogs are so amazing! My Chi was lost in the woods for 7 days, she weighed 2 lbs. 6 oz. at the time . I prayed for her return and on the seventh day a farmer plowing his field saw her , he said later I never get off my tractor but someone spoke to hm and told him to get off and check it out . I was s o thrilled that God answered my fervent prayers that I just want anyone reading this to know God is alive and He hears and answers prayer . I took the little dog to the vet and she was amazed at her condition because it was a very hot week with the Bush full of flys and bugs not to mention all the wild animals that could have eaten her .i changed her name to Karma ! Wow Hazel, that’s amazing that she survived! Thanks for telling us about it! I love miracle stories. I love your story Deb and I love how you are helping senior chis too! Thanks for sharing. My two Chihuahuas sure help me with my stress. And Chio helped me when I was going through chemo treatments for cancer. I cannot live without my little girls, they are the best in the world for me and I have had them certified as emotional support animals. They really are the best in the world Dianna. 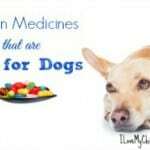 I’m so glad you have your fur babies to help you through your health problems. Thank you so much, Cathy. Anyway, it is hard to describe just how much they mean to me. Chio recently went through a stroke and it has taken a while for her to bounce back. She is 11 years old and I so happy for every day that I get to spend with her. Little Angel is a rescue from Los Angeles and is deaf. L.A. is very dependent on Chio to know when to bark when someone rings the doorbell. LOL L.A. was debarked before we got her, but she can still bark a little. I just love my two little girls so much. You’re welcome Dianna. Hope you have many more healthy years with Chio and your other fur kids.